A few months ago Farine baked these beautiful morning cuddles. They are paired and twisted baguettes. She used oat, plums and hazelnuts. At that moment I knew; this one will be on our breakfast table too. And today is that day!! Elle of Feeding my enthousiasms also found Farine’s morning cuddles. This month Elle is the host for Bread Baking Babes and Buddies. Now I can join the Babes as a Buddie and make Farine’s twisted morning cuddles. This way I caught two birds with a stone or in Dutch “twee vliegen in één klap” or in French “J'ai attrapé deux oiseaux avec une pierre”. Yesterday evening I prepared the poolish and fed my sourdough starter. This morning I started to collect all ingredients for the dough. We didn’t have any hazelnuts but I found walnuts. When I was cutting the “plums” I discovered they were in fact: dates! The combination of walnuts and dates is great, so no problem. It’s obvious we don’t use plums very often. It’s nice dough, easy to handle. I misread Farine’s instructions and made twists with one baguette instead of twisting them as a pair of baguettes. Just when I was ready to bake the twists I saw Susan's of Wild Yeast twists. She mentioned it’s possible to over bake buns and rolls. I know this for a fact. I over baked some buns before because my gas oven only heats from the bottom and to get some color on the top of the buns I need a lot of heat (250°C) or a long time. The thermostat is not accurate, so mostly I just leave it at this high temperature. These twists are ready in 30 minutes at max. 204°C. So you see I needed to come up with a solution. I baked them for 20 minutes in the gas oven and with a pale top I placed them in my electric oven. I normally don’t use this oven; we get a very high electricity bill using it. It wasn’t over yet: when I was pre heating the gas oven I saw a weak gas flame; meaning low on gas. We use butane gas we buy at the shop in our village. Luckily we had just enough to bake the twists for 15 minutes and make lunch. But for our pizza this evening we need to go out and get new bottle of gas. And this came out of the oven. It tastes delicious and Peter couldn't wait until tomorrow's breakfast. At this moment I'm typing this, he's heading off to the kitchen to get another one! My twists are not as beautiful as the ones Farine made, but that's for next time. The night before; mix the poolish and feed the starter. Let both ferment overnight at room temperature. Add the dates and walnuts and mix by hand. Divide the dough in 8 equal pieces of 215 gram each. First I rolled each piece into a baguette and then I twisted each baguette and placed them on a floured couche. Farine wrote to twist the baguette together by pairs. I misread her instruction. Proof until doubled in size (it took one hour and a half 30°C). Pre-heat oven to 400°F/204°C. Thanks to Farine for her twists! 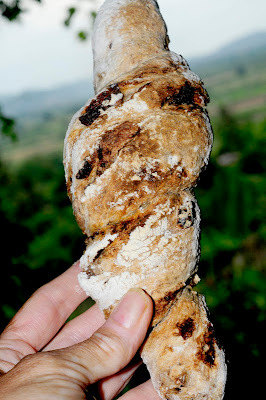 I found these delicious twists at MC Farine of Farine. 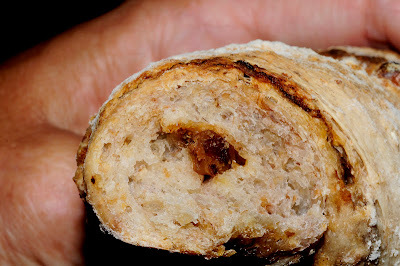 Go and visit her site; she has amazing breads and friends to share and there’s also a lot to learn from her. Isn't it incredible that you can have such "oven adventures" and come out with still wonderful bread such as this. Wonderful using what you have ... I did mine with walnuts too! Great to have you baking with us! Hi Tanna, luckily my twists taste better than they look. I saw the ones you baked, they are beautiful and brown colored. Love the idea of walnut dust, sounds like a fairy tale. Gorgeous twists! The oven situation is a challenge but you met it so well. Walnuts and date are always a great combo. Thanks for baking with the Babes! Thanks Elle, next time I will follow your version of these twists. The recipe sounds also great with buttermilk, but I can't buy it over here. We have to make it first. These twists look fabulous! And I like how you were able to cover more than one event with them. I like that you added the dates and walnuts...I bet they went perfectly with the oats. Thanks Heather, I agree, walnuts and dates go well with oats. But also without oats and bread they are delicious. And this bread is great without the dates and walnuts. Your twists are really beautiful and to my mind just as beautiful as Farine's. And how thrilling that you had JUST enough gas left to finish baking them! Mmmm... walnuts and dates. That sounds wonderful. 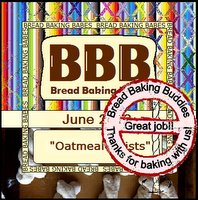 Thank you for baking with us! I love your twist: they look so beautifully "rustical"... what an heartbeating gas-story! This is one of my favourite breakfast bread. I've frozen them and took them out every day! Now they are all gone but will make more soon!